Università degli Studi di Urbino «Carlo Bo»-Dip. di Scienze Biomolecolari, Sezione di Biochimica Clinica e Genetica Molecolare- ITALY. Cor Con International Srl, Res. Dept.- Parma (PR) -ITALY. Loyola University School of Medicine -Chicago, USA. Plasma antioxidants (AOs) represent the main barrier of defense against damaging aggression due to reactive species, by reactive oxygen species (ROS). Moreover, changes in AOs plasma content after supplementation may provide information on the absorption and bioavailability of nutritional compounds and efficacy of AOs therapy. The aim of this study was to make a comparison between the known BAP test (Biological Antioxidant Potential), used for the evaluation of the antioxidant capacity, and the innovative PAT (Plasma Antioxidant Test), and the evaluation of the precision, linearity and accuracy of the new patented PAT on plasma samples taken from healthy volunteers. Twenty-two apparently healthy volunteers were involved in the study for the comparison of the two methods. Analysis performed on 22 plasma samples demonstrated that, following the application of the algorithm, BAP and PAT were interchangeable. PAT resulted extremely precise, linear (R=0.9991), accurate and reproducible (CV 4.17%). PAT values from plasma samples had a normal distribution, evidencing a control range for healthy subjects. PAT can be considered an innovative and predictable method for the measure of the antioxidant power of plasma. When ROS are winning this “battle”, oxidative damage occurs, initiating repair and removal processes. In a biological system like the human body, OS may be seen to start at the molecular level, with a direct interaction between ROS and protein, lipid, carbohydrates or nucleic acids. OS is an emerging risk factor for the development of many diseases (diabetes, cancer, cardiovascular and neurodegenerative diseases, etc. )1-3,5-8 and it can be induced by a wide range of chemical, physical and biological environmental factors (UV stress, pathogen invasion, pollution, smoke, drugs). More than 100 different tests are used for the determination of OS and the prevalent methods are those regarding biomarkers of lipid, DNA and protein oxidation or the antioxidant capacity of the body.1 To measure the antioxidant capacity of plasma samples, different methods have been developed based on the ability of plasma AOs to reduce ferric ions (Fe3+) to ferrous ions (Fe2+). ROS, hydrogen peroxide (H2O2) and superoxide (O2•-) are physiologically produced in a number of cellular reactions, including the iron-catalyzed Fenton reaction,9-11 and by various enzymes, such as: lipoxygenases, peroxidases, NADPH oxidase and xanthine oxidase. In a recently published study it has been demonstrated that some molecules present in biological fluids can interfere with the reaction and create lots of artifacts.11 In plasma, for example, one of the most common interferences is given by phosphates, which have the capacity to bind Fe3+ and form a more stable complex. As a result, the biochemical dosage for assessing the total plasma antioxidant capacity based on iron reduction (e.g. BAP test 11,12) is influenced by the serum concentration of phosphates, leading to an overestimation of the plasma antioxidant capacity. This overestimation can be avoided by introducing the correct quantity of zirconium salts into the dosage, which have the capacity to bind the phosphates without causing precipitation, as it has been done in PAT. Serum phosphate exists in the form of monovalent and bivalent phosphate anions. Approximately 10% is attached to proteins, 35% is a sodium, calcium and magnesium complex and the remaining 55% is present in free-form. The aim of this research was to perform, in the same subject and in the same blood sample, both the BAP test and PAT test in order to assess if PAT results were the same as BAP results, after the application of the suitable algorithm. The precision, the linearity (using the sample dilution method) and the accuracy of the new patented PAT method were also determined. Twenty-two (11 M and 11 F) apparently healthy subjects, ages between 22 and 72 (mean 37±13 years), were involved in the study for the comparison between BAP test and PAT, and for the evaluation of the main features of PAT. Every subject signed a written and informed consent. All experimentation procedures were conducted in accordance with the Declaration of Helsinki. Blood samples were taken on overnight fasting volunteers between 8 - 10 am at the department of Clinical Biochemistry and Molecular Genetics of the University of Urbino by finger pricking and collecting of about 100 µL of blood in a heparinized microvette. The microvette was immediately centrifuged (1600 G for 1 min) to isolate the plasma on which BAP and PAT (HandD srl-Parma) were performed, within 2h from being drawn. BAP and PAT tests are based on the capacity of a coloured solution of ferric ions bound to a specific chromogen to discolour when the ferric ions are reduced to ferrous ions in the presence of reducing substances (plasma antioxidants). The differences between the tests are that PAT solution is made stable by adding a stabilizer that avoids the uncontrolled reaction development and makes the compound free from polarity modifications and allows to make the reaction pH-independent and to avoid the problem of plasma protein precipitation (in particular albumin). Moreover, the innovation in PAT test is the complete elimination of the interferences presents in the sample (for example. phosphates) and the possibility to perform the analysis in 1 min. The quantification of the plasma antioxidant capacity is obtained through a dedicated system, FRAS4 Evolvo (HandD srl- Parma, Italy), a photometer setted up specifically for BAP and PAT analysis at a wavelength of 505 nm following respectively 5 min and 1 min incubation period at 37°C. BAP test and PAT comparison: evaluation on human plasma samples. The BAP test was carried out using the HandD srl (Parma, Italy) diagnostic kit which is commercially available as mono-dosed and pre-dosed equipment. 40 µL of R2 reagent (iron solution) were added to the cuvette containing R1 reagent (thiocyanate derivate pre-dosed solution), followed by 10 µL of the sample. The reading was taken at 505 nm following a 5-min incubation period at 37° C using the dedicated FRAS 4 Evolvo system (HandD srl, Parma, Italy). PAT was carried out using the HandD srl (Parma, Italy) diagnostic kit which is commercially available as mono-dosed and pre-dosed equipment. This test is designed to measure the plasma antioxidant capacity in the presence of zirconium salts added to the reaction mixture. 40 µL of R2 reagent (iron solution) were added to the cuvette containing R1 reagent (thiocyanate derivate pre-dosed solution), followed by 10 µl of the sample. The reading was taken at 505 nm following a 1-min incubation period at 37° C using the dedicated FRAS 4 Evolvo system (HandD srl, Parma, Italy). To standardize the BAP and PAT values and to allow a comparison with the data so far reported in literature on the BAP test, an appropriate algorithm has been applied that allows the transformation of the PAT data. A new unit has been introduced, Cor U, where 1 Cor U has been determined by considering the mean phosphate plasma levels (range between 2.6 e 4.5 mg/dL) which lead to an overestimation equal of about 40%. One Cor U corresponds to 1.4 µmol/L of Vit C obtained with the algorithm: PAT value x 1.40. The value obtained from the algorithm is equivalent to the BAP value. The multiplication factor equals to 40% has been determined by taking into account, at the same time, phosphate evaluation and BAP test values, being demonstrated that BAP values were overestimated by an average of 40%, with oscillation between 25 and 55%. In any way, it is possible that in subjects with higher phosphate levels, the percentage might be major than 40%. The graphs and data analysis were produced using the software application Excel and Origin 6.0. A paired sample t-test was used for the statistical analysis, any p values <0.05 were considered significant. BAP test and PAT test comparison: evaluation on human plasma samples. Table 1 reports the BAP and PAT values in the analyzed human plasma (n=22). Following the application of the new algorithm, BAP and PAT mean values were respectively 2541 ± 247 µmol/L of Vit C and 2542 ± 254 Cor U. The differences between the two tests were negligible and not statistically significant Table 1. Values ​​of PAT and BAP tests on the same sample of capillary blood. Mean value ± SD. On the basis of the linearity tests performed on FRAS4 Evolvo (HandD srl, Parma) using vitamin C as standard, it was found that the values of PAT were linear in the range from 500 to 6000 µmol/L of Vitamin C. In this case, the PAT values were expressed in µmol/L of Vitamin C without application of the algorithm (1.4 µmol/L of vitamin C); indeed, the Cor U, based on phosphate interferences, is conventionally used only for biological samples (plasma, saliva, urine) or when there is a necessity to make a comparison with BAP. Different concentrations of vitamin C, starting from three different stock solutions of 35.20 mg/ml vitamin C (corresponding to 0,20 mol/L), were used in order to develop the calibration curve. All measurements were performed in the same laboratory condition in a one-day analysis at a controlled room temperature (25°C). 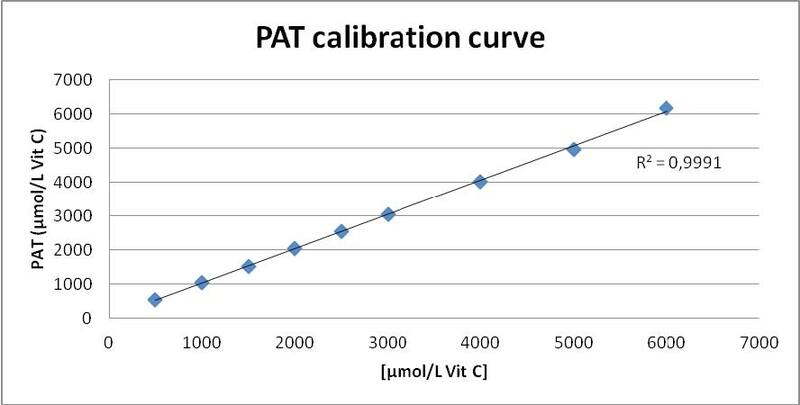 Table 2 shows the mean PAT values obtained (µmol/L Vit C); while Figure 1 shows the graph of the calibration curve obtained with vitamin C. The calibration curve resulted perfectly linear (R2=0,99). Calibration curve of Vitamin C.
To determine the repeatability and reproducibility of the data and the accuracy of the test, PAT was performed on samples of human albumin to simulate plasma Table 3 and repeated on a sample of vitamin C Table 4. Tests on human albumin solution (20%) were performed in 2 different times of the same day, in the morning and afternoon Table 3. The same mean value was obtained with BAP test (internal data). Based on the data obtained, there were not statistically significant differences between the PAT values from 16 consecutive evaluations of the same albumin solution (t test p> 0.05). The mean (±SD) of the measurements was 2286±95 Cor U and the respective CV, calculated by means of the standard deviation, was 4.17%. This result shows the high precision and reproducibility of the method. A series of 10 immediate tests were also carried out on a stock of a known concentration of Vitamin C Table 4. The prepared solution had a concentration of Vitamin C of 2000 μmol/L. The mean value was 1975 ± 21 with a CV equal to 1%. Vitamin C values obtained were expressed as μmol/L. This test shows the high precision and reproducibility of the method. Numerous experimental and clinical evidence indicate that OS is an emerging risk factor for the health of our body. Plasma AO capacity can be considered a measure of physiological, environmental, and nutritional factors (exposure to ROS and antioxidant supplementation) determining the redox status in humans, and can underline the OS conditions in the progression/development of many diseases.2,3 OS is recognized as a pathological condition caused by an imbalance between production and elimination of RS and ROS by the physiological AO defense system. Changes in AO plasma content after supplementation may provide information on the absorption and bioavailability of nutritional compounds and on the efficacy of AO therapy against OS offence. In order to control the AO status, different tests are commercially available. In the present study, a comparison has been done between the common test for the evaluation of the antioxidant capacity, BAP test, and the innovative PAT, following the application of a specific algorithm. As demonstrated in a previously published study,11 the presence of phosphates in the sample causes an interference during the evaluation of the antioxidant capacity based on iron (Fe3+) reduction. The use of zirconium salts in the PAT test avoids this interference because zirconium participates as competitive inhibitor and allows the phosphate clearance within plasma physiological concentration. The study clearly evidences that the observed difference between BAP test (absence of zirconium salts) and PAT comes from the presence of interferences, by phosphates. In fact, the plasma antioxidant capacity dosage with BAP test results overestimated in relation to plasma phosphate levels. However, to standardize BAP and PAT values and to allow a comparison with the data so far reported in literature on the BAP test, an appropriate algorithm has been applied that allows the transformation of the PAT data. Herein, the evaluation of plasma antioxidant capacity on 22 samples demonstrated that, following the application of the new algorithm, the values obtained by PAT and BAP test were perfectly identical; indeed, the differences between the two tests were negligible and not statistically significant. For this reason, the reference values of PAT can be considered the same as the BAP test, as shown by making the evaluation in the same samples. The normal range is set between 2200 and 2800 Cor U. The evaluation of OS at systemic level through the innovative PAT can shed new light on the pathogenesis of different disease, for example, cardiovascular, neurological, inflammatory and chronic diseases. Since many systemic conditions may occur (such as changes in exogenous and/or endogenous factors), the routinely execution of biochemical tests, such as PAT, can provide additional information on general health, new indicators of therapeutic efficacy in the treatment of disease and, at the same time, open new horizon for the identification of new markers. Plasma is a diagnostic fluid and its antioxidant capacity evaluation might be useful in clinical practice in order to quantify the antioxidant power, establish treatments and, subsequently, modulate dosage case by case depending on conditions and the patient’s needs. PAT test can be considered an innovative and predictable method for the measure of the antioxidant power of plasma. The new test has been proven to be simple, precise and fast; in fact, PAT determination delivers in 1 min in comparison to BAP test (5 min for the evaluation). In addition, PAT, by excluding the influence of plasma phosphate and through an appropriate algorithm for the transformation to Cor U values, allows to compare its values with those of BAP and to give continuity to the measurement of the antioxidant capacity of plasma. No financial or contractual agreements that may cause conflict of interest or be perceived as causing are in place. No works are being concurrently published or reviewed that are relevant to the manuscript being submitted to the present journal. The corresponding author and all the authors have read and approved the final submitted manuscript. No portion of this work has been or is currently under consideration for publication elsewhere. No portion of this manuscript, other than the abstract, has been published or posted onnternet. Cite this article: Serena B, Mariangela P, Annarosa F, Davide G, Simona C, Serafina B, Umberto C. Determination of Plasma Antioxidant Power in Capillary Blood through the Innovative system PAT (Plasma Antioxidant Test). Free Radicals and Antioxidants. 2018;8(2):149-52.